WHENEVER PLAYERS ask for my advice on controlling the speed of the cue ball, I always tell them the same thing: Slow down. I'd guess many more shots are hit with too much speed, rather than not enough. So, the best thing to do to give a better feel for speed is to slow your arm down when you're coming forward into and through the cue ball. But more than just slowing everything down, the real key to getting a good feel for your speed is having a smooth stroke. You really want to slow down at the moment you start moving the cue forward toward the cue ball. This allows you to evenly accelerate through the ball, which is critical if you want to keep your arm moving in a fluid, controlled motion. Often, players struggle with speed control on shots where they don't feel all that comfortable. In these situations, the natural tendency is to overcompensate with more power when you are a little lacking in confidence. One exercise that I have students try is shown in Diagram 1. You want to pocket the 1 ball in the corner, while drawing the cue ball back just six inches or so. Some players tend to poke at this shot, because you only want to cue ball to draw back a short distance. But this is exactly where you need to use that smooth, controlled stroke. If you slow yourself down and accelerate into the cue ball, you'll be much more successful - and much more consistent - than if you use a jerky stroke that pokes at the cue ball. Another helpful tip for speed control is getting to know what "soft" and "medium" speeds really mean. 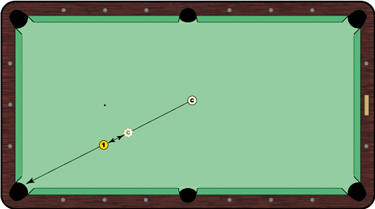 I learned a system from Robert Byrne's "New Standard Book of Pool and Billiards" that is a great way to measure shots. He said that a ball hit one table length is considered a soft shot. One hit down and back (equivalent to a lag) is medium soft. Three lengths is medium, and it goes all the way up to five lengths for a hard shot. Practice with just the cue ball. You'll get an idea of how much force is needed to hit the cue ball three table lengths. This will give you an idea of what really creates a "medium" hit, which can be a rather vague term "medium" hit.